Here at Fine Framers, we know we’re renowned near and far for the quality of our framed jersey service. Still, even we were surprised when somebody came to us all the way from Roscommon. He was Eamon Towey, who regularly played inter-county with ‘The Rossies’ in the past, but who came to us instead with a jersey of the club he faithfully served for many years: St. Croan’s (Ballintubber/Ballymoe). It wasn’t just any jersey. It was the one he wore in the 2015 All-Ireland Intermediate Club Final – one of the highlights of his career. Sadly, St. Croan’s were beaten there by Ardfert (Kerry), but getting there is still an achievement to be proud of. Insert conservation-quality mountboard, to ‘stiffen’ the jersey prior to framing and to prevent it from sagging in the future. Hand-stitch the jersey to this mountboard. Place the mountboard against a backboard that is acid-free, to prevent harmful material leeching into the jersey over time. Hand-stitch the mountboard to the backboard. Leave sufficient space between the jersey and glass, to prevent damage caused by condensation. Offer a choice of regular or specialty glass for the frame. Choices include a reflection control glass, to enhance visual impact; UV-resistant glass, to combat the long-term effect of harmful rays from the sun; or a combination of these in premium ‘museum glass’. He knew his prized jersey was in safe hands with us – so we set about doing an expert job. Eamon didn’t just bring us his jersey for this project. He also brought us photos from that championship campaign, and his county and provincial medals. We laid them all out in an attractive formation in the mountboard. We also included cut-outs that listed all panel members, and the key results from the championship. Once the lay-out was agreed, we fixed all items in their final positions, completed the framing job, and presented the finished item to a very happy customer. 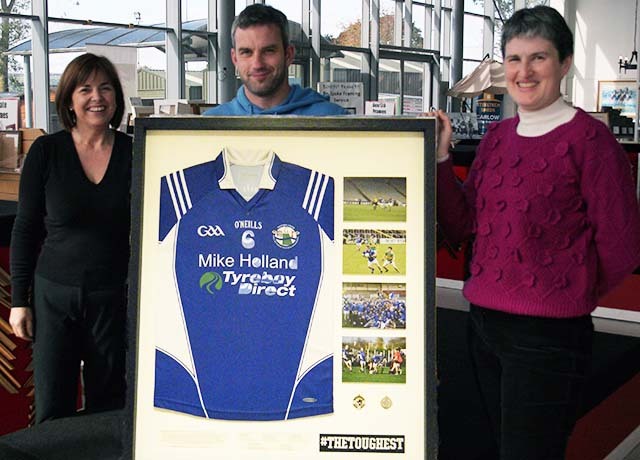 The framed jersey now takes pride of place on a wall in County Roscommon. It may be quite a few miles from us – but that just shows how far an expert job can go! What is two - 2?